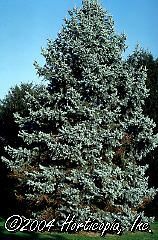 Tall, narrow, upright evergreen with tight branching that forms a columnar shape. Lush bluish-silver foliage. Prefers moist well drained soils.